Hello again. So, another week has come to pass, and new episodes have been watched. Did they hold up to the openers ? Did a show betray all my expectations already ? Well, read on to know ! This second visit to the five girls’ base was just as pleasant as the first one. It helped introduce the character better, even though nothing moved forward too much. In a way though, it’s a bit like the beginning of Haibane Renmei, so it’s not bad per se. 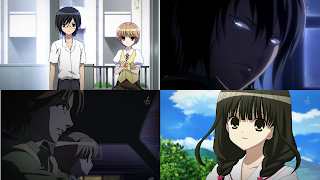 Though I hope the next episode will see the start of some kind of overarching plot. There is a question that this episode really didn’t help answering : why the military theme ? For now, it could very well be simply for the moé factor. Or, maybe it’ll develop into something more, a deeper reflexion. I’m praying that it’s the second option, as Sora no Woto seems clever enough. I was pleasantly surprised to see that even if Kanata, our main heroine, is the typical “genki-everything-is-wonderful” girl, she isn’t a brainless moeblob. For one, she isn’t scared of ghosts. Too many animes would have had their heroine squeal and make “cute” frightened faces, but Kanata seems to be above that. 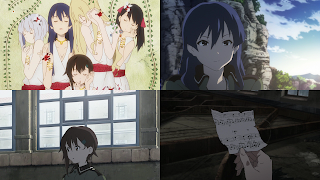 I still have great hopes for Sora no Woto, if only for the opening, which is intriguing enough. Ookami Kakushi 02 was a very good surprise. The mystery only thickened, with a new character having been introduced. As of now, it’s still too late to draw any conclusion, but I’m guessing that things are not going to end up well for Kaname, the girl who’s also kinda new in town, and is probably a little too curious for her own good. As for Hiroshi, our main protagonist, he’s still weirdly popular, but it seems like he’s going to go through some disturbing events, judging from the preview of episode 3. 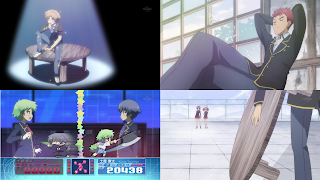 And it’s something that Higurashi did not do. For all its gory and unsettling moments, it didn’t have characters that looked like they were sexual deviants. I hope it’ll be handled well, because if it’s the case it could make for a very disturbing show. I just hope it won’t go overboard and into fanservice territory. But I have faith, the storytelling here seems pretty solid, and only two episodes in I’m already hooked. I need to know the truth. This is shaping up to be the big disappointment of the season. Even though it got some plot going, this episodes still felt quite empty. Plus, friggin’ werewolves ? Come on, are all vampires stories required to have werewolves too these days ? Also, if at least it served an actual good plot, it wouldn’t be such a big deal, but having the protagonist suffer amnesia is a cheap trick. Then there are the scenes where our main character outruns a helicopter machine gun, or avoids a missile simply by ducking. And still in his human form, mind you. Add to that the totally gratuitous “shadow gel” scene, and you get something that is easily the worst show I’m watching this season. I still hopes it’ll get better, but I won’t hold my breath. Durarara!! frightens me now. Honestly, I’m starting to wonder if the universe is suited to contain this much awesomeness. Maybe it will tear the fabric of space and time apart, I don’t know. Because, seriously, if this show manages to maintain this level of quality, it’s going straight into my top five animes of all time. It’s already showing signs of greatness, and it’s only been two episodes. Already, the seemingly supernatural headless rider surprised me by actually being a character with a personality, and not just a plot device. 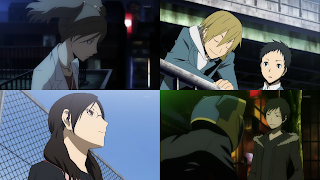 Then Durarara!! does something that delights me to no end : it shows simultaneous events from the perspective of several characters. I cannot get enough of that kind of storytelling. And it’s plain gorgeous, artistically it’s really top notch, both graphically and aurally. Really, words fail me, I cannot convey how much I love this series. Verdict so far : AWESOME !! This one is still totally crazy, and it’s still funny, so it’s good ! I suppose a special mention goes to the main protagonist who spends a big part of this episode with a table glued to his hand. 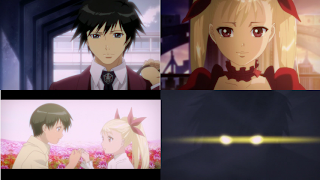 I suppose this could be compared to a show like Ouran : crazy antics and pretty standard romance. I hope the crazy part will remain the main focus of the show, or that maybe it’ll even turn into something more down the line, but anyway I’ll still be going with the flow. A very light series, but one needs that from time to time, I suppose.